I’m getting to know the crew of the Pegasus barge now and sitting down to learn what it’s like to care for and voyage with the Very Important Passengers (VIPs) of these seaborne trips from Michoud Assembly Facility to Kennedy Space Center, Fla.
No, the VIP is not the blogging public affairs officer. The VIP is one of the most pampered, carefully assembled, machined, hand-crafted, and handsome external tanks ever built that fuel the space shuttle’s thirsty main engines. The VIP behind us on the deck of the Pegasus is ET-134. This tank sails under the care of Pegasus’ four-person barge crew and in time, in early 2010, it will fly into space. ET-134 voyages over the sea with Pegasus in good company. Boatswain Richard Gager (Rick), 52, was born in Newburgh, NY. Newburgh is near the Intersection of Interstates 84 and 87 and just north of the U.S. Military Academy at West Point on the Hudson. He grew up in Houston Texas, graduated James Madison High and joined the U.S. Coast Guard right out of high school. Richard retired after 20 years in the U.S Coast Guard as a Chief Boatswains Mate (E-7) with qualifications as Officer in Charge Ashore and Afloat , and as Under Way Officer of the Deck on board a U.S. Coast Guard harbor tug, the USCGC Capstan, three inland construction tenders; the USCGC Axe, USCGC Anvil, and USCGC Wedge. The Wedge was later converted to a river buoy tender where Rick served as the vessel’s Executive Petty Officer. During his Coast Guard career, he served in Mobile, Ala.; Corpus Christi, Texas; Destin, Fla.; the Washington, D.C. area; New Orleans, La. ; Demopolis, Ala.; and New Smyrna Beach, Fla. Also, Rick is a qualified Search & Rescue/Law Enforcement Boat Coxswain and a graduate of the USCG Maritime Law Enforcement School. On board Pegasus, Rick is Lead Crewmen (Boatswain). When not herding external tanks between Kennedy Space Center and Michoud Assembly Facility, Rick likes riding his Harley with his wife and generally working around the house. Pegasus AB Seaman Bernard Conway (Skip), a native New Yorker, says he is tied at the hip to the sea. His decades of waterborne work have not diminished his love of all things aquatic as he describes himself straight forward as “always a Long Island waterman at heart.” In the early 1980’s he relocated from New England to the Space Coast in the fishing industry and eventually found him plying the waters of the Indian River Lagoon, with a ring-side seat of many spectacular shuttle launches. Other opportunities and a growing family, led Skip to seize the chance to go “tugging” as a tanker man with a large fuel and barge business. In 1997, he joined USA’s marine operations as a crewmember on board the Liberty Star’s sister ship the Freedom Star. Skip now finds himself assigned to the Pegasus, where he serves as an Able Bodied Seaman. Well! You do learn something every day! Time away from work for Skip is mostly spent composing, recording, and performing his original music. Dave is a unique member of the seafaring crew — he is a former U.S. Army paratrooper (1984-1988) with some 45 parachute jumps mostly from C-130 and C-141 Air Force transports and Army UH-1H Huey helicopters with the “All American,” 82nd Airborne Division. Dave served as a small vehicle mechanic in the parachute rigger company of the 407th Supply and Transportation Battalion at Ft. Bragg, NC, Airborne! Dave, 46, is a native of Toledo, Ohio and currently lives in Titusville, Fla., nearby the Kennedy Space Center. When asked how he transitioned from airborne operations to seaborne operations he said that after leaving the Army in 1988 he started in logistics operations at the Vehicle Assembly Building at Kennedy Space Center working with stacking Solid Rocket Boosters (SRB) and in 1994 transitioned to marine operations as a SRB retrieval diver. Today, Dave serves as the marine engineer of Pegasus with responsibilities for all mechanical and machinery operations. He assists with deck operations during external tank delivery operations and at home base assists with SRB disassembly technical support and SRB retrieval. When not on the job Dave likes to, relax with family, play with his grandson and work around the house and yard. Airborne! Let’s meet some more of the horsepower of the Pegasus. Jim Harrington, 51, was raised in Scotts Hill, Tennessee (population of 150). That’s halfway between Memphis and Nashville. Jim grew up with no running water or electricity and says about his early upbringing, “if you didn’t grow it or catch it, you didn’t eat!” Jim’s family later moved to the Chicago area, where he graduated from Crete-Monee High School in Crete, Ill.
After high school Jim joined the U.S. Navy, ultimately serving in the submarine service for nine and one half years. Jim served on the submarine USS Thomas Alva Edison SSBN 610 & submarine USS Henry Clay SSBN 618, both were “boomers” or ballistic missile subs, as a Navigation Electronics Technician 1st Class. While on shore duty and still in the Navy, stationed at the Naval Ordinance Test Unit Cape Canaveral Air Force Station, he enjoyed working in an electronics shop which permitted him to go to sea often with the naval test unit. 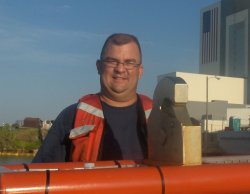 After serving in the Navy Jim joined the maritime operations team that services the NASA Solid Rocket Booster recovery ships, working for USA. Jim has now served 21 years in USA Marine Operations in a variety of jobs including retrieval diver, deck supervisor, and as crew member on Freedom Star and Liberty Star. Currently working as a marine electrical technician, he holds marine credentials as a Qualified Member Engine Department, Junior Engineer and Ordinary Seaman. He supports Solid Rocket Booster Recovery operations, booster disassembly, external tank tow operations, and marine operations supporting NOAA and the Navy. When not on the job, Jim enjoys boating, scuba diving, fishing, archery, hunting, being with family and Harley riding. Dennis is not on this particular trip, but since he is regular member of the Pegasus crew he wants everyone to know the care and happy voyage of external tanks is his top working priority. Dennis, 35, is from Merritt Island, Fla., nearby the Kennedy Space Center. He has attended college at Seminole Community College and is currently completing coursework and licensing through the Maritime Professional Training Institute, Ft. Lauderdale, Fla.
Twenty one years on the water on everything from commercial fishing vessels to working for cruise lines to dockside repairs and recreational sport fishing, has honed his maritime skills and increased his interests in the sea. Dennis’ duties and responsibilities on board Pegasus are to maintain overall seaworthiness, handling lines, general maintenance and repairs, and making tow. When not on the job as shepherd of external tanks to Kennedy Space Center, he likes to spend time hunting, fishing and time with his family. Previous Previous post: Pegasus Ready to Depart From Michoud at 7 p.m.